Lyon is attracting an increasing number of Chinese investors in a number of sectors from silk to football. The history between Lyon and China dates back to the 16th century, when Lyon was the European capital of silk and the westernmost point of China’s silk route. It was also a cultural melting pot and printing capital; even then, Lyon played a prominent role in the promotion and dissemination of Chinese culture in France and across Europe. 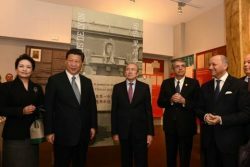 Ever since, Lyon and China have maintained strong ties that have continuously developed over time, thanks to a number of partnerships: the creation of the Franco-Chinese Institute in 1921, for example, as well as the first Chinese university outside the country, located in the heart of the Saint-Irénée in the 5th district of Lyon. As a result, several generations of students have trained in Western culture and science thanks to this institution and under the patronage the University of Lyon. This institute has played a major role in relations between Lyon and China, which remain strong today in many fields. From an economic point of view, the relationship built by silk traders was reinforced by economic exchanges in the mechanical, chemical and medical fields. In 2015, the famous “silk route” was re-opened with a new rail link between China and Europe. It is the first freight train to run between between the Chinese city of Wuhan and Lyon. China is now Lyon’s 6th biggest investor. While pharmacy, agri-foods and energy are of particular interest, no sector is left out. As for the intentions behind these investments, they are varied: international development within the domestic market, or the acquisition of technical expertise, brands, raw materials, or strategic products. Bluestar Silicones: the silicone branch of Rhodia taken over by Bluestar, a subsidiary of the Chem China Group, in 2007. This is the largest Chinese investment in Europe to date. In 2012, they inaugurated Iris, a new resin production unit (a €7 million investment). Bank of China opened a Lyon agency in 2012 with the goal of encouraging French investment in China and supporting local companies. NFM Technologies ( Neyric Framatome Mécanique) bought out by NHI (North Heavy Industry) in 2007, the company operates within the aeronautical and nuclear sectors, tunnelling and large-scale construction. Midea: manufacturers of air purification equipment. World’s #7 household appliances manufacturer. Yingli Green Energy set up a subsidiary of its leading photovoltaic components manufacturer in late 2009. Huawei: One of the world’s first suppliers of new generation telecoms systems opened its first sizeable regional office in late 2011. Haier, a leader in the household appliances, air con. and home heater market, chose to set up its 2nd European R&D centre in Lyon. In 2016, 3 Chinese companies set up in the Lyon area and were supported by Aderly: Glory Company (e-commerce), Biostime Groupe (agri-foods) and Isem Technologies (automobile industry). Find out more about Lyon and China’s relations! More information about Lyon's economy, contact us !